Anyone who works in the web hosting, cloud, or data center industries knows that network outages are unavoidable. No matter how many redundancies you have in place, “stuff” happens. 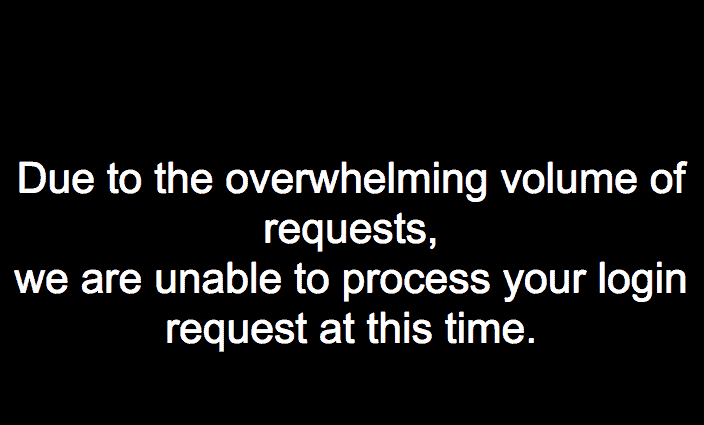 No-one is immune, even Amazon has major outages. With that reality in mind, I am somewhat sympathetic to NeuLion Inc., who finds themselves in the midst of a public relations nightmare. NeuLion is a streaming video provider who works with major sports leagues like the NFL, NBA, and the UFC. NeuLion was the streaming provider tasked with distributing the Floyd Mayweather Connor McGregor fight, an event that broke pay-per-view buy records. 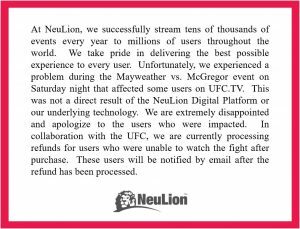 NeuLion’s troubles started when many of the users who bought the fight for $99 were unable to stream it. There was a Reddit thread with over 25,000 upvotes and 2,000 comments. Be seen to be doing the right thing. Don’t get #1 and #2 mixed up. Mr. Hoggan’s main point was that too many companies jump straight into Step #2 without doing their due diligence with Step #1. If the public thinks you are more concerned about maintaining your brand’s perception than fixing the problem, any make-good efforts will come across as insincere and will exasperate the damage already done to your brand. You really need to emphasize doing the right thing, and you need to do so genuinely. There are some good examples of companies jumping straight to Step #2 over the years. Who can forget the fallout after the BP gulf oil spill? BP was criticized for reportedly spending $50m on a public relations campaign following the spill, while their response to cleaning up the spill was widely perceived as inadequate. BP’s CEO Tony Hayward was featured in 60s television commercials where he is clearly jumping to Step #2, and was unsurprisingly criticized by the public. These events spawned an infamous parody twitter account and led to long-lasting damage to the BP brand. BP would’ve been way better served focusing their millions exclusively on the clean-up first, doing a good job of that, and not trying to deceive the public in the meanwhile. And the response from the public? Underwhelming. A full day after posting, NeuLion’s statement had just one retweet and six likes on Twitter, which pales in comparison to the attention they received on Reddit during the outage itself. The damage was done. I wonder what took NeuLion so long to make a statement? Perhaps NeuLion was still working on Step 1 and were trying to determine what would be the ‘right thing to do’. Or more likely, NeuLion had concerns about potential litigation and remained tight-lipped at the behest of their legal team. In another part of their offices, the marketing/communications team must’ve been pulling their hair out. Legal concerns or not, they should’ve made some sort of statement sooner. You can express empathy for what occurred without acknowledging any wrong doing. 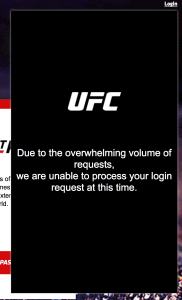 They should’ve said something along the lines of: “We are deeply sorry about the streaming issues experienced during the Mayweather/McGregor fight. As sports fans, we understand how frustrating this would be. We are working to determine the cause of the issues and whether they lie with internal or external systems. 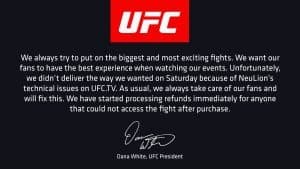 We are also working to determine how to go about dealing with the impacts this has had on the customers of the UFC. Please understand it may take a few days before further information is provided. Once again we sincerely apologize, please know we are determined to fix this. We have no further comment at this time.” That would’ve at least bought them some time to formulate a plan. There are a lot of similarities between the PR challenges being faced by NeuLion and when web hosting companies experience network outages. You can’t get the downtime back nor mitigate the inconveniences experienced by your customers. So circling back to Mr. Hoggan’s 3 step PR model again, what’s the ‘right thing to do’ after an outage? Simply fix the technical issues as quickly as possible while providing high-level updates via social media. The objective for the updates via social media isn’t so much to accomplish Step 2 in being seen, but rather to keep important stakeholders informed when they are otherwise lacking any information, which in my opinion is just the right thing to do. So what’s the best way to be seen fixing the technical issues? Promptly publicize a follow-up incident report with as much transparency as possible, detailing what went wrong and what steps will be taken to prevent it from happening again; just like Amazon did. Time will tell how NeuLion’s brand will fair after this very public incident. No doubt their brand perception has been damaged badly. The sooner they get on with ‘doing the right thing’, the better their brand will fair in the long-term. I doubt simply issuing refunds will be good enough considering the headaches fight fans endured. Devin Rose is eBridge’s Senior Marketing Strategist, a role in which he wears many hats. Devin doesn’t actually own many hats though, as he isn’t particularly interested in fashion. 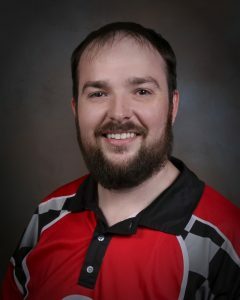 When he’s not helping B2B technology companies acquire new customers, Devin enjoys following the Vancouver Canucks and cooking elaborate meals.